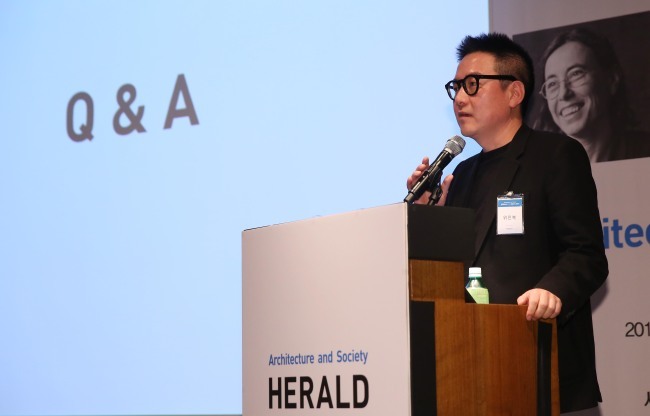 Renowned architects shared their design philosophy during a session of the Herald Design Forum 2017 that took place on Tuesday under the slogan “Design for Humanity” in Seoul. The first speaker for Herald X Dgit was Carme Pigem, a Spanish architect and member of the Pritzker Prize-winning architectural firm RCR Arquitectes. A main design philosophy of her firm is harmony among the building, the site and the environment, according to Pigem. “For us, understanding a site is very important as the site itself can be an important source,” Carme Pigem said. Pigem said when her firm designs a new building, they first consider the place’s unique condition and atmosphere. She presented diverse projects showing how they could design a building by being in harmony with nature and the environment. She presented her past project, a multipurpose building called Les Cols, where they had left the existing house as it was found with the aim of retaining the existing environment and being in harmony with the new building. The next presenter was Korean architect Wee Jin-bok, who highlighted the importance of engineering and rebuilding social relations for design. He said architects should consider projects from the perspective of engineering in an extreme environment such as an earthquake and typhoon. “When we went to the Philippines in 2013, a huge typhoon had left Tacloban city devastated. Some volunteers from non-government organizations came and built shelters all connected with each other on the ground of increasing collective resistance. It was the wrong idea because the connectivity will only make ventilation difficult and humid,” he said. He also mentioned the rebuilding of social relations as another role of design. “In Korea, the word ‘design’ is used as decorating something beautiful. 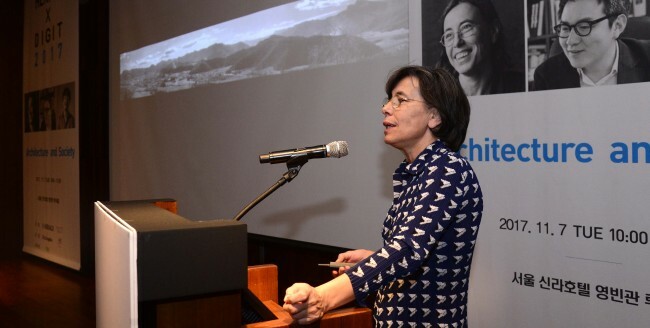 However, from the perspective of architects, design should serve to rebuild social relations,” Wee said. He presented his past project as an example of how design can rebuild social relations. ”There are more than 400 community service centers in Seoul that operate from 9 a.m. to 6 p.m. We wanted to use the empty space at night for citizens to forge bonds. We created a theater outside the center for people to gather,“ he said. With the theater drawing more residents at night, communication among neighbors increased and the crime rate went down, he said. 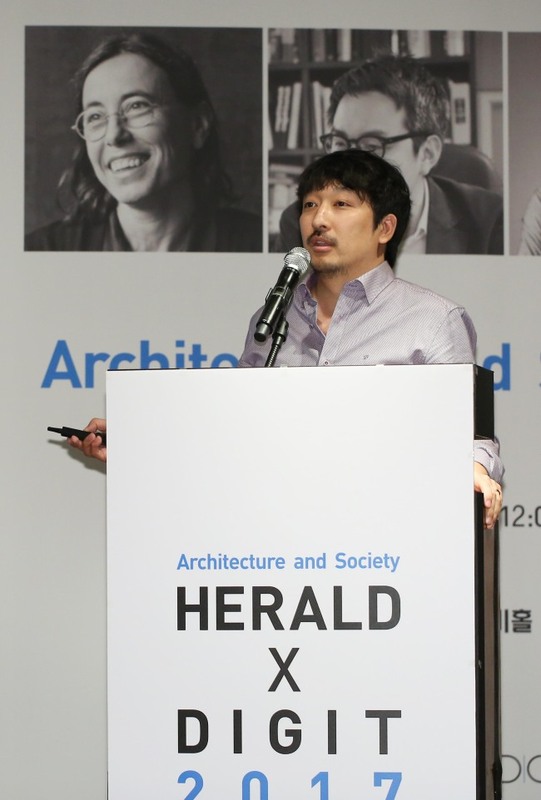 Architect Baek Hee-sung, the head of KEAB, stressed the importance of one’s memory in designing a building. He said history is the past which many people share in common but memory is something that only individuals can have. He presented an ongoing building project in Saejongdaero, Seoul that was made by a touch of numerous citizens. “We let people write what they want on a computer, print them out, put them in a box and insert each box into the wall of the building. When the walls are full of the message boxes, this building will be full of memories of people,” he said. Another project his firm did was “Hanriver Memory Gallery” that is now floating on the Han River with the aim of recovering the memory of sandy beaches. “Not many young people know that we had five sandy beaches at Han River decades ago. So we built Hanriver Memory Gallery on Han River. Inside the gallery, we created an environment where people can get a beach-like experience,” he said.